Just because the Octagon is enjoying a mini hiatus doesn’t mean the hoopla train has also pulled into the station for a break. “UFC 160: Velasquez vs. Bigfoot II” takes place May 25 and we’ve got the extended video preview to prove it. 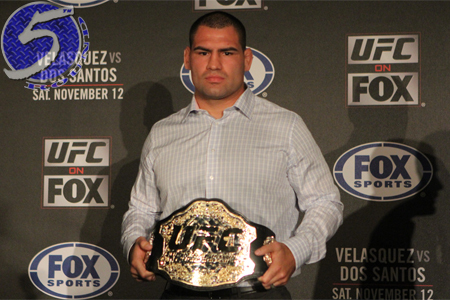 A heavyweight rematch between champion Cain Velasquez (pictured) and Antonio “Bigfoot” Silva headlines the pay-per-view broadcast. Velasquez easily disposed of the Brazilian just one year ago. Former 265-pound champ Junior dos Santos meets Mark Hunt in the co-main event.